The news broke while we were on a plane, somewhere over Pennsylvania; a grand jury was being called to determine if Bonds lied under oath during the BALCO hearings. 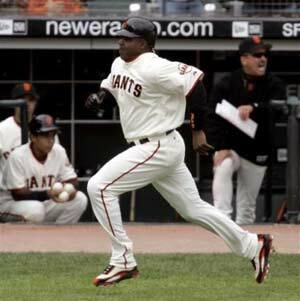 This was, of course, all the rage on ESPN, though Pedro Gomez has to be depressed that now Roger Cossack — who's never even in San Francisco — is the first go-to guy on Bonds news. At least Cossack isn't propped out for the inevitable "Barry had no comment." Apparently, a federal grand jury is convening — and all the legal experts keep saying that a convening grand jury almost always means an indictment, unless, of course, your prosecutor happens to be a DJ — and hopes to nail Bonds for saying he didn't do steroids when he did. Or something like that. Listen, we've been harder on Bonds around here than anyone. But we're talking about jail here. Bonds was not convicted of anything — or even accused of a crime — in the first place. Perjury is perjury, yes; but we're really starting to veer dangerously toward "We Will Take Him Down At Any Cost" territory. Is that a worthy goal? Perhaps. But if you think that this — really — is about anything other than Bonds having a chance to hold the all-time home run record, you're crazy. If Bonds had retired after last season, do you think all this is happening? Really? One of our favorite scenes in "Game Of Shadows" is the race against the clock that the USADA has, as it tries to nail BALCO track-and-field dopers before the Athens Olympics, to save itself the embarrassment of an American winning a gold medal and later being nailed for HGH, or whatever. It wasn't a criminal investigation, or at least not yet; they just wanted people they thought were doping out of there. Maybe you think that's fair, and maybe you don't, but if you don't think this doesn't have something directly to do with Bonds' chase, you're crazy. We're starting to kind of think Bud Selig should step in, like, right now, rather than waiting for Bonds' knee to blow out, which is pretty obviously what he's doing. It wouldn't be fair, the players' association would lose its mind and it would set a dangerous precedent. But this is getting out of hand. But not before Saturday. We can't wait to see Bonds hit at Dodger Stadium.